Sadly, there are not very many photographs of the 3/2 Gurkha battalion from 1943 in books or in archives, so I have had to use the image seen to your left to depict the true spirit and selflessness of the ordinary rifleman and his devotion to his platoon and fellow comrades. 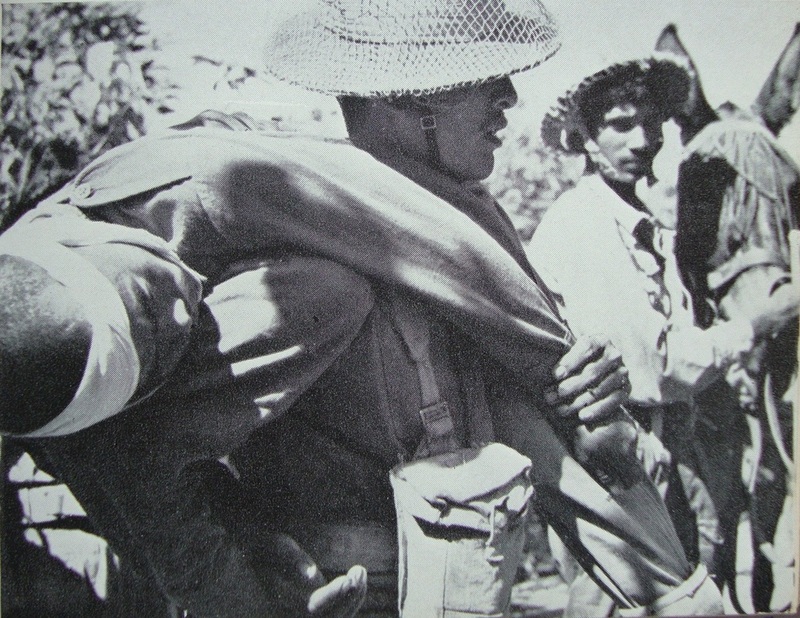 Here we can see one man of Nepal carrying his wounded brother away from the fighting and to a place of safety in 1944. The battalion were fresh and raw in 1942 when they joined up with the 77th Indian Infantry Brigade at Patharia. They had to learn fast and on their feet, which in the main they succeeded in doing. They overcame last minute leadership changes, unusual tactical drills alien to their straightforward military character and the immense stress of working behind enemy lines. Led in 1942/43 by Lieutenant Colonel L. A. Alexander, the 3/2 Gurkha Rifles performed their duties on Operation Longcloth to the best of their abilities and with great spirit and bravery. In this section you can read about some of their stories, memories and medal citations. ​Recently added to these pages, the 3/2 Gurkha Roll Call, a listing for many of the men who served with the battalion in 1942-43. Tilbahadur Thapa. A story of Gurkha survival. Sancharbahadur Rai and the long journey home. Captain James Smallwood. Scroll down the page to find his story. Man Bahadur Gurung (first citation on page). Kum Sing Gurung (second citation on page). Jit Bahadur Rana (third citation on page). Roll of Honour. Including anecdotes from: Mike Calvert, Denis Gudgeon, Adrian Hayter, George Dunlop, Dominic Neill, Ian MacHorton and Harold James. A Brave Battalion. The story of Ram and Laxman Gurung. George Silcock. Scroll down the page to find his story. Arthur Sidney Best. Scroll down the page to find his story. Hubert Birtwhistle. Scroll down the page to find his story. A new book has been published by the family of Major Eric Stephenson, late 3/2 Gurkha Rifles, entitled 'The Happy Warrior'. Major Stephenson served on Operation Longcloth in Chindit Column 2 and was one of the few members of this unit to continue on with the operation after the action at Kyaikthin rail station. 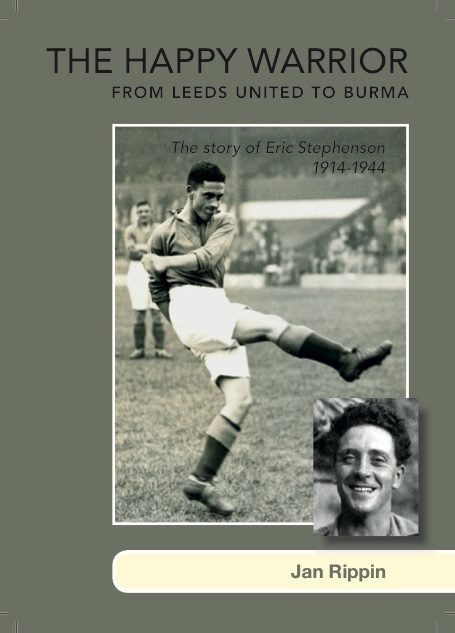 Eric was a professional footballer before the war, playing for Leeds United and being capped twice for England, he was sadly killed in the Arakan region of Burma during the campaign in 1944. For details about the book and how to obtain a copy, please see the information below. The Happy Warrior, front cover. 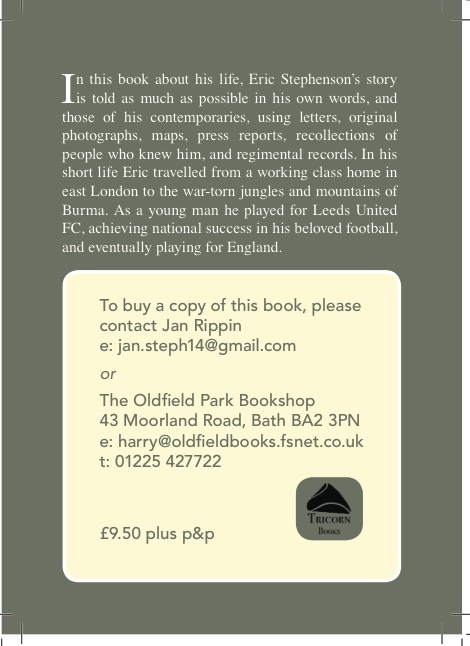 The Happy Warrior, back cover and contact details. Copyright © Steve Fogden 2011/14.